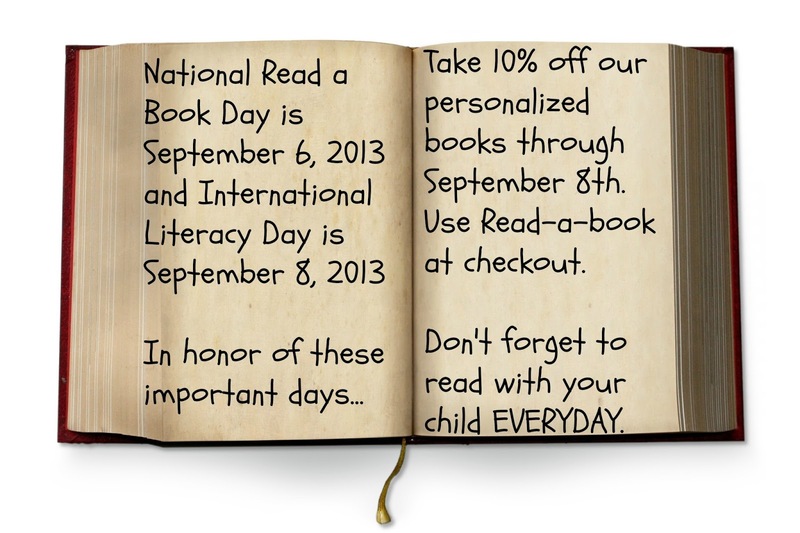 Today, September 6, 2013 marks National Read A Book Day. It’s a day about dropping all technology and curling up with a good read. So turn off the television, computer and electronic devices and choose a great book to read and relax with. Encourage your children to read their favorite books or read with them. It’s important for kids to see YOU read as well which will promote good reading habits in your household. Reading with your kids builds strong bonds between parent and child and helps improve logical thinking skills. Reading is the most important thing you can instill in a child’s life because it helps improve their vocabulary, memory and concentration. You can make your reading session entertaining with your children by acting out the characters voices and reading with emphasis. You can even dress the part or act out the storyline. When you make reading fun they will always want to read! Getting them a personalized book to add to their collection is a unique keepsake and they will want to keep that book forever. Books come and go as they outgrow them, but a personalized children’s book will last for a lifetime. It’s a book about them and they will think it is so cool. They become the stars of their very own story and will build their self-esteem. 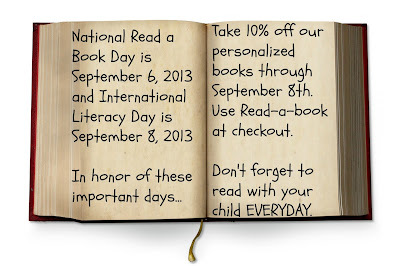 To get you started on purchasing this unique gift we are offering a 10% sale on personalized books today through September 8, 2013 which marks International Literacy Day. Use coupon code Read-a-book at checkout. How important is it to read to your child or instill the love of reading in them? According to the United Nations Educational, Scientific and Cultural Organization (UNESCO) who initiated International Literacy Day in the year 1965, some 775 million adults lack minimum literacy skills, one in five adults is still not literate and two-thirds of them are women, 60.7 million children are out of school or drop out. We urge parents to make sure that their children do not become part of these statistics. Read everyday for 15 to 20 minutes with your child or have them read on their own is all that it takes.